This is the batting tee advice you need. But, first, here is the dilemma – The batting tee is the best hitting device ever made, at least in my opinion, but it is the biggest waste of time at the same time. How can that be? you ask. Well, when used correctly the batting tee is an indispensable tool for the serious ballplayer and when used correctly it can give feedback better than pitched batting practice. Yes, knowing a few tricks of the trade on a batting tee can tell if a player’s swing is correct, whereas with batting practice players can look like great hitters even with flawed swings. 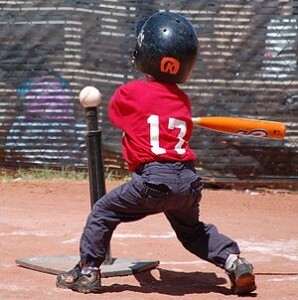 There are numerous 5:00 o’clock hitters out there, but cannot hit the ball correctly off the batting tee. I for one want to see batters that can produce consistent results with certain batting tee locations. That tells me they are capable of the correct baseball or softball swing and when the timing is added, better in-game results show up. However, when people do not know how to use it for the most benefit, it turns into that mentioned waste of time and possibly a detriment to the player’s improvement. Yes, if players swing with bad results swing after swing on the batting tee, they reinforce bad hitting fundamentals and habits that will show up in games. A majority of major league baseball players use the batting tee to warm up and for the swing feedback they are looking for. Players can use this t-ball practice to make quick adjustments from game to game. Following are the basics of using a batting tee that players and coaches should know. Set the batting tee up the farthest distance possible to see the complete flight of ball away from the net. If only hitting a ball a few feet into a net, set up a small target that designates middle and about chest high of hitter. Vary locations of the tee, and relatively often – low, high, inside corner, outside corner. Make sure players stand the correct and same distance away from the tee and home plate as they do in a game. Use a home plate first before setting tee down. Understand the ideal hit rises slightly, no matter the tee height, and in direction of where the tee is placed. Hitting the top part of the tee slightly is correct. Do not allow players to be satisfied until they consistently get the right results off the tee. When hitters get accomplished at one spot, switch tee location for a few swings and then return to the previous spot and see if the same good results, and hopefully on the very first swing. Work 75% on pitch players struggle with most in games – if can’t get the ball in air work on the low pitch until they can get it in the air. If hitting too many lazy fly balls and pop-ups in games, work more on high tee location until they stop hitting the top net or chopping the ball down. Jack Perconte is the author of three books, one to help players hit and adults to teach it, one to help parents navigate their way through the complicated world of youth sports and his latest, a comprehensive coaching guide to make a positive difference in people’s lives – players, parents and their own.